Rolling basketball racks are handy storage devices that enable gym instructors and frustrated parents to organize sports activity balls. Most of the carts we examined are 3-tier options that can be loaded with basketballs, soccer balls, volleyballs, and other sports accessories (bike helmets, etc.) in a pinch. The Trigon ProCage is a little bit different- it is a locking cage, instead of a 3-tier rack. Many buyers we spoke to were intent on organizing their outdoor recreational areas, cleaning up loose and scattered activity balls in a safe and dry space (no mildewing), while still allowing their children access to their equipment. One buyer commended the Baden rack for preventing the family dog from chewing up and ruining the equipment. Some buyers also described using these as basketball shooting racks, allowing them to take a bunch of three-point shots in a row like their heroes Chris Paul and Stephen Curry. One buyer told us that it was pretty simple to assemble, but because the steel frame is lighter-duty, you'll need to be especially gentle when assembling it so that you don't strip a screw if you are using power tools. Some buyers didn't like the 'Baden' branding, while others thought it was kind of stylish. Let's take a look at 5 of the best-selling basketball carts on the market today and see how they stack up. This portable basketball stand offered by SSG is well-made, durable and an excellent choice for storing basketballs, soccer balls or volleyballs. Users love that it’s easy to move the rack around, but some do note that there are no assembly instructions. This rolling ball cart is available in two models – a rack with three shelves with a capacity for 12 balls (45” x 18.6” x 2.6”) and a stand with four shelves and 16 balls capacity (51” x 17.8” x 3”). The basketball cart has heavy-duty chromed steel tubing construction, hard rubber casters, and 16-inch deep shelves. A buyer comments that this wide ball cart is perfect for anyone that loves to play basketball and that it doesn’t take much space. The reviewer also adds that it takes about 15 minutes to assemble the portable rack and that he is very impressed with the quality. Another user shares that you only need a screwdriver to put together the stand, and even though there are no instructions – he didn’t have any difficulties. He would recommend it to any basketball fan looking for the best portable ball cart. A satisfied purchaser also states that it’s perfect for an outdoor basket court and that it’s light enough to move around without the balls falling. However, some customers have complained that the ball rack is uneven and unstable and that they didn’t receive any screws for assembly. Some also note that the wheels keep falling off. 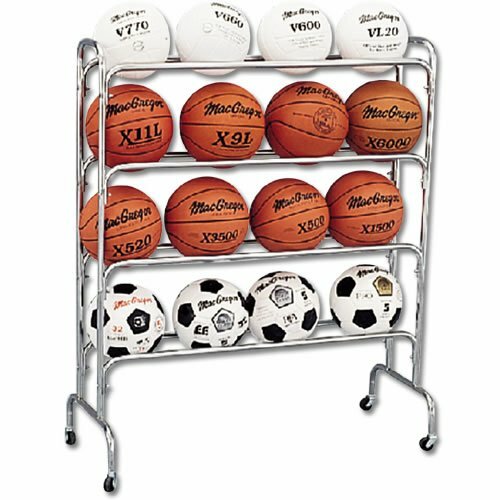 If you are looking for a convenient way to organize your basketballs, you might take a look at this steel ball stand offered by Baden. Users love the sturdy construction, but some do note that the assembly process is complicated. This basketball portable rack has a steel frame construction, four non-marring casters for mobility, three 14-inch deep shelves, and it can hold 12 standard size balls. It measures 39 ¾” x 41” x 14”, and it weighs only 13 lbs. As a whole, this is a high-quality steel basketball rack, and it’s perfect for sports lovers. As a whole, buyers have a very high opinion of the Bade steel basketball stand, and they praise its functionality, construction, and stability. A user comments that this ball cart looks very stylish and elegant and that it takes about 20-30 minutes to assemble it. Another happy customer mentions that the cart arrived quickly and in excellent condition and that it surpassed all his expectations. 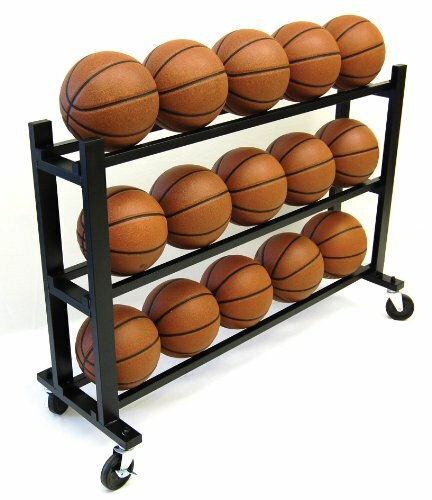 A purchaser also shares that this holding ball rack is a necessity for anyone that plays basketball and that his children enjoy organizing their basketballs on it. However, some customers have warned that even though the steel construction is sturdy and durable, the wheels are wobbly. They advise that you shouldn’t lean on it and that you should assemble it carefully to avoid damaging the parts. This compact basketball cart offered by Coast Athletic is well-designed, stable, reliable and practical for a school gym. Users love the easy assembly process, but some do note that the wheels don’t roll smoothly. This portable basketball stand measures 43″ x 9 1/2″x 30″, and it has a wide base design for stability, three shelves, blue finish, a capacity for 12 standard basketballs, and four caster wheels to move it around the gym. Overall, this is an excellent choice for anyone that likes to keep his balls in one place. 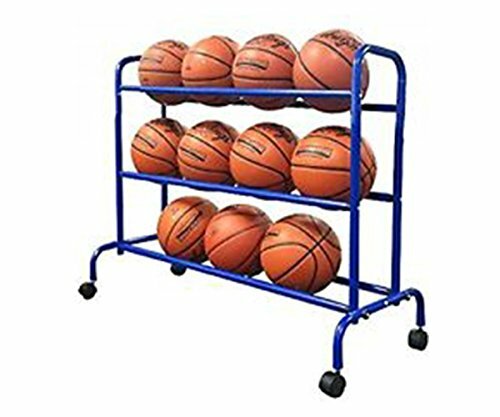 A buyer comments that this ball rack cart is extremely useful during her children’s basketball games and that it took her only 20 minutes to fully assemble the stand. The reviewer also mentions that the ball rack is stable, well-balanced, and the balls stay in place. Another user states that this portable basketball stand is light and easy to roll around, even with the balls in place. A happy purchaser also says that the ball cart arrived quickly and in perfect condition and all the pieces fit together easily. The user also states that it can hold over 15 small balls. However, some customers have complained that the color of the rack they received doesn’t match the provided description and they were disappointed with their purchase. A user also notes that the basketball stand is not as stable as he expected, but it does a nice job. This 3-tier portable basketball cart offered by Trigon Sports is expensive, sturdy, useful and well-balanced. Users love that the wheels roll smoothly, but some do note that the assembly can be cumbersome. This ball stand has a solid construction made of 1-inch square steel tubing, durable powder-coat finish, four HD caster wheels and it measures 49″ x 16″ x 35″. It can hold up to 15 medicine balls or basketballs, so it’s suitable for a professional gym. But you should be aware that it’s manufactured in China. In general, users have a favorable opinion regarding the Trigon 3-tier ball stand, and they praise its construction and stability. One buyer comments that he managed to assemble the stand in less than 15 minutes and that he was very surprised by the quality of the materials. The reviewer also shares that it’s a good idea to have one more person to help during the assembly process and that the basketball cart is sturdy and doesn’t wobble at all. Another happy customer mentions that this is the best basketball rack that he has ever owned and he highly recommends it. The buyer also states that he can leave the ball cart outside and it won’t rust. However, some customers have complained that the package arrived with two wheels instead of four and that they had to go to the hardware store to purchase the necessary wheels. If you are looking for a high-quality ball stand that you can lock for extra security, you might want to check out this HD secure ball rack offered by Trigon Sports. Users love the locking feature, but some do note that it’s expensive. This ball locker cart is made of heavy-duty 1-inch steel tubing, and it has a powdered-coated finish, a capacity for 28-30 standard size balls, a hinged lip for safety, four caster wheels, and it measures 45″ x 24″ x 38″. Overall, this is the perfect choice if you need to leave your basketball cart unattended for long, but you should know that it’s manufactured in China. As a whole, users agree that this is a basketball holding rack of high-quality, and they praise its stability, sturdiness, and functionality. A buyer comments that it took him about 20 minutes to assemble the stand and that the wheels are large and made of thick metal, so he doesn’t worry that they’ll break. The reviewer also states that the ball locker is so sturdy that you can sit on top of it and it won’t fall. Another happy purchaser mentions that it’s very easy to roll the stand around and to lock it and that he uses it regularly during PE class. He would recommend it to anyone looking for a secure ball locker. However, some customers have complained that the ball stand was poorly packed, and as a result, the surface of the cart was scratched, and the hardware bag was ripped open. The BSN Widebody Ball cart was one of the first options we examined- it comes in 12 ball or 16 ball capacities, in 3 rows. Its manufacturers say that it is a heavy-duty option constructed of 7/8" chromed steel tubing, with non-marring rubber casters to ensure that it doesn't mark up the floor while also providing a wide, topple-resistant base. Ideal for volleyballs, basketball, soccer balls and even general-issue playground balls, this cart is great for schools and physical education teachers, even recreational club managers who require storage space for these athletic accessories. One buyer who we spoke with says that it is ideal for people that love playing basketball or have children that play multiple sports. It is a sturdy option that remains pretty maneuverable on its wheels and generally takes under 15 minutes to assemble. Another buyer stored his basketball, soccer balls and even then inserted some bike helmets to free up space in his garage for his four children. While no assembly instructions were included, all it took for most users was a screwdriver to set it up. Other buyers recommend opting for the 16 ball capacity basketball storage cart because they end up using the extra storage space on a variety of other accessories. Indeed, it frees up a tremendous amount of space, while also helping to preserve indoor and outdoor basketballs from water and mildew damage. 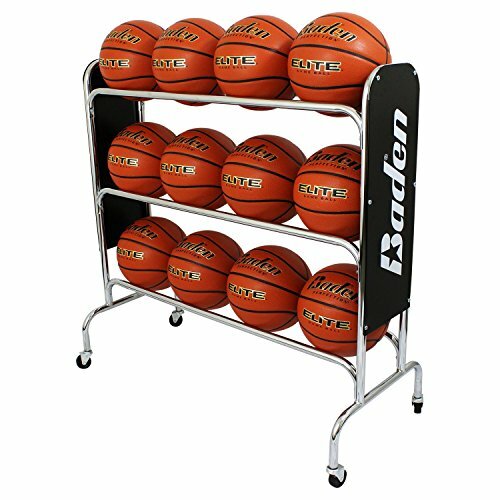 Another option that we took a look at what is the Baden basketball shooting rack- the manufacturers say that it can hold 12 official size basketballs, and is reinforced with a sturdy steel frame sitting on rolling wheels. One buyer we spoke with said that it was kind of complex to assemble, but after about 30 minutes they figured it out and now it is a sturdy and stylish organizational complement to their garage. While other buyers also endorsed the quality and relative inexpensiveness of this steel basketball rack, they disliked the branding on the side. 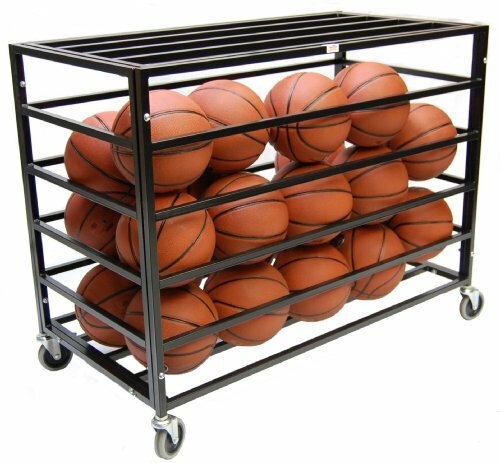 One physical education teacher who is a high school basketball coach says that this basketball storage cart is essential to conducting organized sports practices. The Coast Athletic portable basketball shooting rack was yet another option that we took a look at. The manufacturers say that it has a particularly wide base engineered for high-level stability, with caster wheels that provide exceptional portability around recreational facilities and gymnasiums. It's equipped to hold 12 basketballs or other sports balls on three levels. One buyer we spoke with was fairly pleased with his purchase of this mobile basketball rack, saying that it does indeed hold 12 basketballs, the casters are pretty maneuverable, that it was easy to assemble, sturdy, and includes handles so that it's easier to move around. On the downside, he received the wrong color, which was an annoyance. Plus the rack was a little bit warped when they received it so they had to put in some elbow grease to straighten it out so that it would sit flush on its four wheels, and they found that after it was set up it was a little bit too narrow for their needs, which made it a little bit unbalanced. Placed in their garage, for the most part it functions as a stationary basketball cart and can accommodate volleyballs, bouncy balls, and generally any round object that their children play with. Another buyer installed it in the backyard, ensuring that he brought it into the house whenever the weather became inclement, because these are not all-weather basketball carts. He says that the activity cart is a simple means of having his children keep things organized in the backyard, preventing accidents when he or his wife navigate their backyard in the dark and trip over loose sports equipment. In addition, one of their dogs loves destroying and chewing up basketballs and soccer balls, but by installing them inside this basketball cart organizer, it eliminates the problem of canine destruction, while also protecting the sports equipment from mildewing when stored in cardboard boxes. Since it's so easy to move around, you can store it outdoors, and then roll it in for the evening. Another buyer we spoke with says that this was the ideal solution for organizing a basketball court's worth of loose balls at their local charter school, saying that before their purchase their basketballs, volleyballs, and soccer balls were scattered everywhere. They would frequently get misplaced, left out overnight, and generally the whole thing was a mess until they got one of these storage cart racks that efficiently organizes everything into a handy standalone rack. The Trigon Sports ball cart was another option we took a look at. This three-tier ball cart is a Chinese-made sports rack designed for different sports, able to hold 15 medicine balls or basketballs at a time. One buyer told us that this is an especially sturdy ball rack, that the wheels roll smoothly and that activity equipment is easily stored in this cart. In addition, assembly was not a problem, with most buyers finding that it took around 15 minutes to get it bolted together. However, one user did have some trouble using the included wrenches to tighten the screws and fit the bolts- saying that it took him over an hour to get it completely set up. Another Trigon Sports offering is the secure ball locker. The design of this is a little bit different- it is not a rack, but actually a basketball locker designed to hold 28 to 30 balls inside of a 1-inch steel-tubed locker wth a hinging lid. Buyers are pretty satisfied with this secure ball cage, saying that for the price it is the best one on the market, assembles in under 20 minutes, and its 4-inch caster wheels are made with quality metal, making them durable and maneuverable. Indeed, some buyers noted that they had purchased basketball lockers in the past with tiny wheels and ended up breaking off under the weight of stored medicine balls, soccer balls, and basketballs. Many physical education instructors purchase this cart to organize their gymnasiums and to keep school children from accessing the equipment unsupervised. Another buyer said that they were able to store upwards of 30 balls, depending on how many intermediate-sized sports balls they were using. This storage cart uses a padlock and users say that there is about 6 inches of space between the bars. 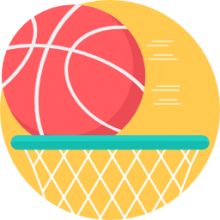 When it comes to caring for a basketball, or any type of activity ball, that is made from synthetic or rubber materials, it's essential that you understand the basics. Make sure to store the ball at room temperature, keep it properly inflated, clean it off of debris and dirt, make sure to use mild soap and warm water to do this, never soak the basketball, try not to expose it to harsh weather for a prolonged period of time, i.e. leaving it out of doors in direct hundred degree sun or winter freezes. If you need to store the basketball for an extended period of time, or if you are moving and need to pack it up, you can always deflate it, ensuring that it remains at room temperature. There are a variety of ways to store basketballs and activity balls for different sports- you can use a ball trolley, which is great for playground balls. There are vertical ball racks you can purchase that either sit stationary on the floor or can be hung up with a hanger. As we have seen, there are ball lockers or ball cages, enabling you to have lockable storage for various sports activity balls. And, as we have seen, as well, there are wheeled options- with some basketball and soccer ball storage solutions functioning like a two-wheeled cart with a mesh bag to store activity accessories. You can even find wall-mounted options that will cradle footballs, kick balls, soccer and basketballs. Whatever your need rest assured that you can purchase a basketball cart that helps to organize your indoor or outdoor recreational area.